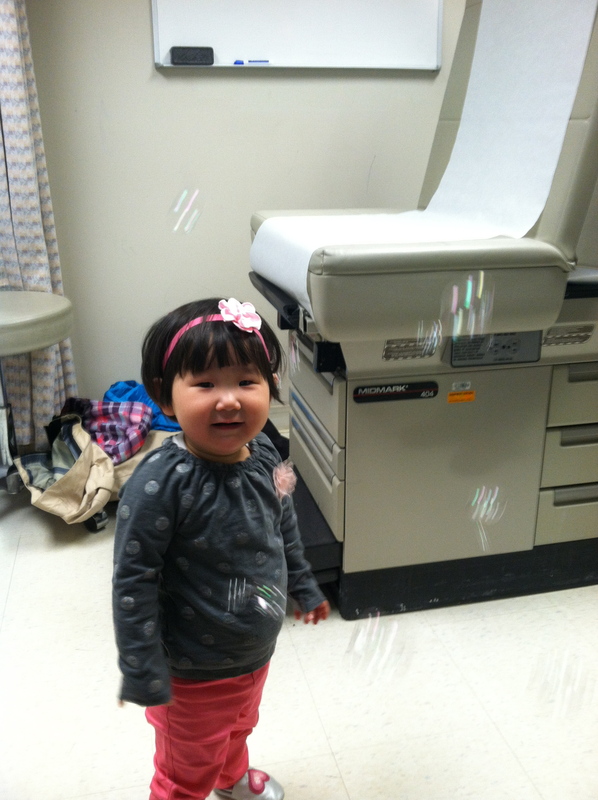 Feb 20th, we had our big Dr. appointment for Lydia. Her first big evaluation by the ‘Cleft Team’ at University of Chicago, to determine where we are at, and what exactly is going on in that little mouth of hers. It was a great appointment with her first surgery set for this Wednesday morning, March 5th. And since the appointment, while we continue to see wonderful forward momentum in many areas, we’ve experienced some regression in others. Even with the assurance of our forward steps toward healthy attachment and bonding, we’ve experienced some set-backs in the area of sleep. She has never liked her crib. I think it’s because she spent too much time in one for the first 21 months of her life… I wouldn’t like it either. 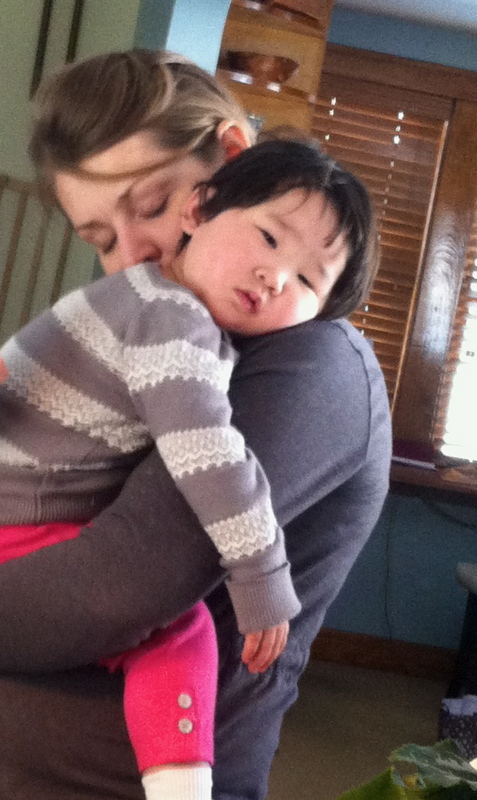 But somehow, after our big Dr. appt day, her feelings have taken a turn from moderate distaste to pure disdain. She hates the crib. This means that the routine we had for 5 weeks in China and at home, of rocking her to sleep and then carefully placing her in her crib no longer works. Now the moment we begin to lay her down, so jolts awake in a fit of rage. She is ticked! How dare we leave her in that crib. So the last week+ has been filled with failed attempts at sleep. We’ve tried holding her hand through the crib. No go. Music. No dice. Whimsical ceiling projections. Didn’t work. Singing. Nope. Laying with her on the floor beside her crib. Not sure what I thought this would accomplish. I have prayed over her. For sweet dreams and deep sleep and happy thoughts about her crib. Nothing has changed, she’s just not having it. 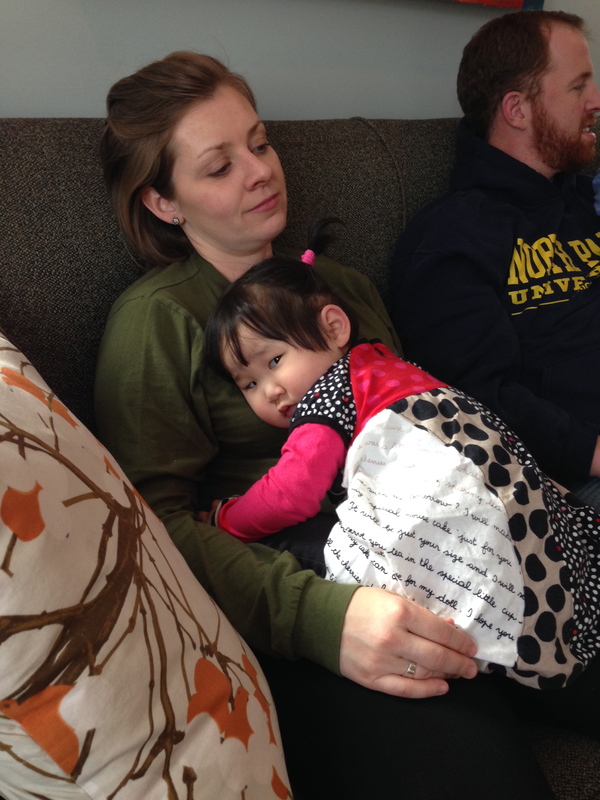 Some days last week I devoted 6+ hours a day to rocking her at nap and bedtime. And the boys got very little attention. I felt horrible. It was a no-win. But on one particularly frustrating night a few days ago, (when I had to tell the boys to put themselves to bed, again) I had a grand realization as I sat in the blue chair rocking sleeping Lydia. All this sleep craziness, is actually answered prayer. How ironic. For months I sat in the blue chair, praying for Lydia. I prayed that she might feel safe and secure in our love. That as we held her, she would attach to us, trust us, bond. And here we are. She has no interest in being soothed by a soft toy, the edge of blanky, a pacifier or even her thumb. She just wants me. I’m it. I’m the soother. I can pick her up after a fit of heaving sobs and she is sound asleep in my arms in mere seconds. She feels safe and secure and peaceful. She rests. All she really wants is someone to be with her. To be near, like listening to our heartbeats, near. And then she rests. It’s beautiful. And if I didn’t have other children to care for, homework to help with, other needs to meet, I would gladly sit in that blue chair forever and just rock and rock, because it’s heaven. But with Lars working three or four nights a week, I have to do my best to figure out how to juggle three at bedtime. And the truth is I haven’t really and I’m tired, we’re tired. And in one day any sense of ‘figuring out sleep’ will go by the wayside, because miss Lydia will be in surgery, and then recovery and we will start the figuring-out all over again. But one thing remains, I get to be her soother. I will climb in that hospital bed with her, I will hold her as long as she wants me to and I will treasure the way her little body molds, and rests in my arms. Amazing to think Lydia waited 21 months for a mother’s embrace. And now that she has it, it’s all she wants. It’s her peace. How awesome. I believe God made us with a deep longing for this kind of love and so even in my very sleepy state, I will remember, this is exactly what I prayed for. Beautiful! What a blessing, even in the trials! God is good! Katie, so glad that Lydia has bonded to you and Lars and feels comforted by you. I love your insight into the sleep problem (sitting in the blue chair praying Lydia would feel safe and secure in your arms) and know this won’t last forever. At least you know she is able to reach out and feel your love. Praying for your family as Lydia has surgery and goes through recovery. Thanks for sharing! My prayers are with you and for Lydia, as her surgery day approaches. I will also pray for good sleep for all of you! My prayers will be with you extra strong on Wed. for the surgery. Sure hope the sleep problem gets solved soon especially for you, Katie. 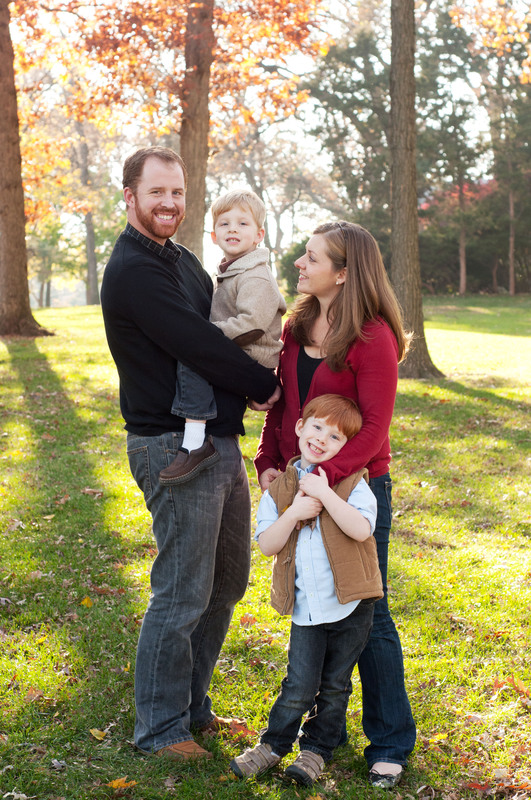 Katie and Lars, I am soooo sorry about Lydia and her sleep problem–I pray for her a lot and You kids. We had friends long ago who had to take their girl every night for a ride in the car so she would fall asleep!!! Maybe if you would put the crib in the boys room she would not feel alone???? How about some warm milk before bed??? Could you try the crib in your room for awhile??? Maybe dumb ideas—just trying to help. I am praying about her surgery. Gramma C.
You said it perfectly! While I’m still in the waiting to get him home, it is such a good reminder! I love what you said, “she waited 21 months for a mothers embrace and now she has it and isn’t letting go”, or something like that…so very insightful! Thank you!!! Praying you do get some rest in the midst of all of the transitioning! She is just so precious. I love your words about the sleep issues. I have often felt this way especially since I have Kate to think about as well. I hope surgery went well & she is sleeping sweetly.